Sharon Drew Morgen » A buying decision is based on more than need. That means your questions are biased, the answers are biased, and the data you get is such a small subset of the necessary data that precludes buying decisions that sellers end up making costly assumptions: they’ll close ‘soon,’ the buyer is a ‘hot prospect,’ for example. It makes it so difficult for sales managers to predict the real pipeline, and for sellers to know who to spend time with. Think about it: when your baseline assumption is that just because you’ve ‘uncovered a need’ that you have a prospect, you have no idea who is really going to buy, or you would have closed a lot more business. WHY IS YOUR STATUS QUO YOUR STATUS QUO? 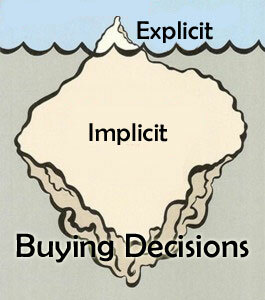 A buying decision is based on so much more than need. Do you need to lose a few pounds and join a gym? Why haven’t you? Do you need to end a relationship? Why haven’t you? Do you need to get a new car? Why haven’t you? the political, relationship, strategic, political factors that have created and maintained the status quo have a route to change (i.e. bring in something new) without disruption. If your buyer perceived that an Identified Problem was important, they would have fixed it already. Indeed, they probably have – they will undoubtedly already have some sort of work-around (see my discussion re work-arounds in my new book Dirty Little Secrets: why buyers can’t buy and sellers can’t sell and what you can do about it. Think about this when you are doing lead gen, or using social marketing, or prospecting. Just because your solution matches a need does not mean you have a prospect or buyer. Buying Facilitation™ is a change management model that helps buyers navigate through their behind-the-scenes decision issues. It’s not sales – sales comes afterwards. But it is a decision facilitation model to help influence just those things that buyers need to accomplish without you, and for which you sit and wait. What would you need to believe differently to be willing to recognize that a buying decision gets made behind-the-scenes, separate from the match between your solution and their need? And how would you know that understanding their need is the last thing they need from you? Literally. Learn how to help buyers navigate through their internal decision issues.